Where am I? › Home > White Papers > Amazon Web Services > Microsoft SharePoint on the AWS Cloud - Learn How! Amazon Web Services (AWS) provides a complete set of services and tools for deploying Microsoft® SharePoint® Server on its highly reliable and secure cloud infrastructure platform. We are offering a technical paper that reviews how to use these services, and that provides detailed technical guidance on how to configure, deploy, and run Windows workloads, including a Microsoft SharePoint Server farm, on AWS. The paper, Microsoft SharePoint Server on AWS: Reference Architecture, illustrates reference architecture for common SharePoint Server deployment scenarios and discusses their network, security, and deployment configurations so you can run SharePoint Server workloads in the cloud with confidence. After reading the paper, you should have a good idea of how to set up and deploy the components of a typical SharePoint Server farm on AWS. You learn which artifacts to use and how to configure the various infrastructure details, such as compute instances, storage, security, and networking. This paper covers two common deployment scenarios for SharePoint Server-intranet and public website-and how to run them in an AWS cloud environment. It discusses how you can leverage different services that AWS provides (network setup, server setup, security, and deployment) and configure them specifically to run enterprise-class software like SharePoint Server at scale in a secure fashion that is easier to maintain. 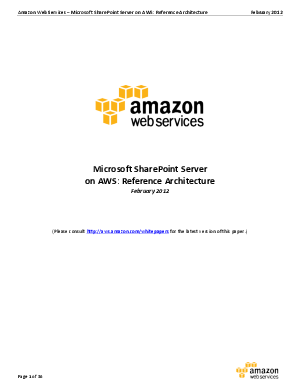 Download the Microsoft SharePoint Server on AWS: Reference Architecture whitepaper today to learn more.